Be the first to share your favorite memory, photo or story of Tristan. This memorial page is dedicated for family, friends and future generations to celebrate the life of their loved one. 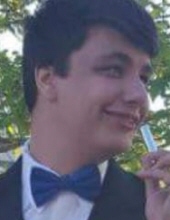 Tristan Wyatt Kuritz, 21, passed away on Sunday, February 3, 2019 in a tragic automobile accident on I-70 near Tonganoxie, Kansas. He was born on August 15, 1997 to Keith E. Kuritz and Denise K. Gharst. He was a 2016 graduate of De Soto High School in De Soto, Kansas. Following high school, he attended Centriq Computer Training School where he learned computer skills. He was then employed by Long Motor for just a few months before the accident. He was engaged to Samantha (Sami) Duckett, whom he had known since 3rd grade. They were planning a May 2020 wedding. Tristan and Sami were inseparable, truly sole mates and looking forward to a bright future. Tristan was preceded in death by: his great-grandparents Jack L. Gharst Sr. and Liselotte H. Gharst from Kansas City, Kansas. He survived by: his parents Keith E. Kuritz and Debora M. Springer of Brownboro, TX and Denise K. Adkins and Lance A. Adkins of Eudora, KS; fiancée Sami Duckett; brothers Kody Kuritz, Kamron Kuritz and Anthonie Adkins; grandparents Dennis A. and Jacque Gharst of Olathe, KS and Bill and Teresa Adkins of Shawnee, KS; grandmothers Deborah J. O'Dell of Shawnee, KS and Jane Fussell of DiBoll, TX; grandpa Don Kuritz of Lone Jack, MO; uncles Christopher P. and Bridget Gharst of Olathe, KS, Jeremy A. Gharst of Lawrence, KS, Kevin and Macy Kuritz of St. Joseph, MO and Clifford Kuritz of Independence, MO; aunt Janet and Thomas Straley of Lee's Summit, MO; cousins Tevis, Kylan, Caleb, Courtney, Austin, Sterling, Abigail and Emela. Services will be held at Cornerstone Family Worship, Eudora Campus, 827 Elm St., Eudora, KS 66025 on Saturday, February 9, 2019 starting with visitation from 3-5PM and funeral service beginning at 5:00PM. Officiating the service will be Pastor Michael W. Gharst from Paola Christian Church in Paola, KS. In lieu of flowers, the family would appreciate memorial donations to www.GoFundMe.com. To plant a tree in memory of Tristan W. Kuritz, please visit our Tribute Store. "Email Address" would like to share the life celebration of Tristan W. Kuritz. Click on the "link" to go to share a favorite memory or leave a condolence message for the family.